The TIM instrument contains four Electrical Substitution Radiometers (ESRs) to measure incident solar power (see ‘The Concept of Electrical Substitution Radiometers’ below). A NIST-calibrated precision aperture in front of each ESR defines the area over which sunlight is collected. The ratio of radiant power to aperture area gives the TSI, generally expressed in units of watts per square meter [W/m2]. The TIM reports 4 TSI values per day, each an average of the 50-second cadence measurements the instrument acquires when the Sun is observed. In its normal operational mode, a TIM shutter is cycled 50% open and 50% closed every 100 seconds throughout the orbit. This provides a direct measurement of the incident solar irradiance. Measurements of dark space during the eclipsed portion of each orbit correct for background thermal contributions of the instrument internals. Periodic calibrations of the TIM electrical servo system track the stability of the instrument gain. The four TIM ESRs provide redundancy and the capability to track degradation. As the primary ESR is exposed to unfiltered solar radiation, the absorptance of the ESR changes due to solar exposure. Intermittent and simultaneous measurements of the Sun with the primary and a lesser-used ESR track the solar exposure dependent changes in the primary ESR. Ground-based data processing corrects for such instrument degradation in released data. 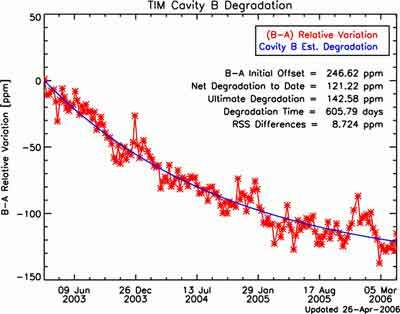 The TIM instrument shows better stability than any other spaceborne TSI instrument to date. 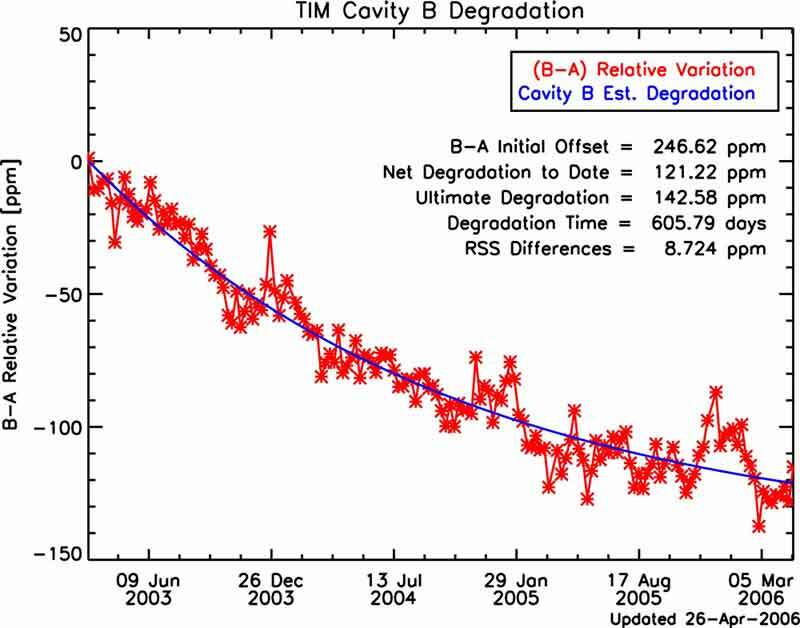 The TIM is following a classic exponential degradation of sensitivity, presumably due to a slight brightening of its absorptive interior surfaces, and is expected to ultimately change in sensitivity by only 160 ppm (see TIM Degradation Figure below). The basic theory of ESR detectors is based on the measurement of electrical power to maintain constant detector temperature as incident radiation is modulated. Two identical sensors, one active and one used as a thermal reference, are housed in the same environment and maintained at the same temperature. The sensors have a very high and accurately-known absorptance in order to efficiently collect incident radiation, so that nearly all photon energy incident on the detector is converted into heat. A constant amount of Joule heat is supplied to the reference sensor by a resistive heater circuit, elevating this reference sensor to some temperature. The active sensor is actively driven to this same temperature by a servo system that determines the electrical power necessary to heat it via its resistive heater. This thermally balances the two sensors at the reference sensor’s temperture, and requires similar electrical heater power to each sensor in the absence of any incident light. When radiation is then allowed to fall on the active sensor, such as when that sensor’s shutter opens, a corresponding amount of electrical heat to that sensor must be reduced in order to maintain constant temperature. This reduction in electrical heat to the active sensor is equivalent to, and effectively “substituted” by, the radiant energy incident upon it. By knowing this electrical heating to a high accuracy, the incident radiation is measured to similarly high accuracy.